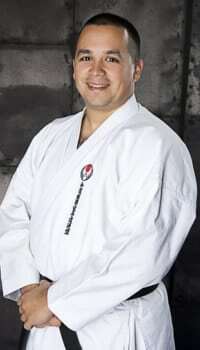 In the AAU Junior Olympics in 1998, Sensei Garcia won a bronze medal in kata. In ’99 AAU Nationals, Sensei Garcia earned a silver medal in kumite. Also in 1999, Sensei Garcia was invited to be on the Junior World team and compete in the World Championships in Budapest, Hungary. Sensei Garcia won a bronze medal in kata. Sensei Garcia taught the credited Karate, Self-defense, and kickboxing courses at Collin County Community College from 1999-2003. Since 2001, Sensei Garcia has been the Junior Program Director at the Academy of Classical Karate-do. In January 2009 Sensei Garcia became the Director of Instructor Development (a leadership program designed for up and coming leaders and instructors at the dojo). Dr. Garcia taught Special Education in Garland ISD for 5 years, an Assistant Principal in Sherman ISD for 1 year, and has been an Assistant Principal in Plano ISD since 2011 at the elementary level. His goals include being a principal, director, and later he has aspirations to be a superintendent. Dr. Garcia also teachers masters and doctoral level courses at A&M University Commerce as an adjunct professor. He has taught areas of educational law, best practices, has been a supervisor for master level students seeking a principal certification. He currently is a Licensed Professional Counselor with a small private practice with a focus on professionals attempting to overcome short-term mental challenges, or obstacles in their life with a second emphasis on adolescents with shyness difficulties. He’s had experience working for at Timberlawn Psychiatric Hospital since 2006 and continues to work PRN, he believes it will help serve him with his private practice and staying current in the psychotherapy field.